What sort of loads do you transport? a) Loads that include furniture, fragile freight or that require two or more men to load or unload. Private and commercial E-bay, E-Tail and Retail deliveries of small loads like lounge suits, tables, antiques, buffets, beds and wardrobes. Wherever possible our pricing is based on sharing the cost of a full truck. In essence the cost of the long distance (linehaul) part of the trip is shared amongst all users based on how much space they take up and where its going to and other factors. If you need a pickup or delivery from a country or outback area, thats great, but there is unlikely to be anyone else wanting to do the 'off main highway' part of the trip at the same time as you, so our price will reflect the fact that at least some of the trip costs can't be shared. If you can get your consignment to or from somewhere in a larger town nearby, try ammending the location on your quote to the larger town and get a revised price. In a nutshell, outback and Northern Territory prices will be unavoidably high . Do we need to use the Website to get a quote.? You can use whatever means you like to get in touch. Phone, chat from our website, email, fax or mail. The website is fastest because the quote gets generated more or less straight away and it operates all the time. The day before pickup for pickups from Capital Cities is generally fine. For other locations, 'day before' is mostly fine, and if not we will pickup on the next available truck. The short answer is just let us know once you have a date, and we should be able to accommodate you. What if there is more than one pickup or delivery address? Please enter the distance to drive (Kilometres) between all pickup addresses (or all delivery addresses) in the field provided when you get your quote. For example if there is a second pickup in an adjoining suburb 2 Kms away and a third pickup another 10 Kms from there, enter 12 Km in the 'distance between pickups' field. Do you double handle our stuff or does it go direct on the same truck that picks it up ? Well we didn't used to. We used to do everything direct, door to door. That was the cheapest way. Unfortunately there came a point about 10 years ago when the fuel price went from $1.00 per litre to $1.50, that it started to become cheaper to use a small truck to pickup the little jobs and then load them onto the long distance “40 litre per 100 km” line-haul trucks at a depot. At about the same time it also started to become too difficult to get the big trucks into the inner suburbs. Streets were narrowed for tram stops, bike paths and just to block then off for fun. Worst of all many high rise apartments now have nowhere to park. So the answer is, we may or we may not double handle, depending on whatever is best at the time. If its a whole house job we normally wouldn't, but where its better to take a small truck we may now do that for a pickup or delivery. How firm are your prices? Fixed prices are based on your list of items and any accompanying description of goods to be moved. We also take into account access issues - stairs, lifts, floors and distance of walk. If these are all as described then the prices are firm, and remain firm for 7 days unless a different period is indicated in our quote. Prices may vary depending on when you are wanting to move, so a price may change if you change the date. We've received your price. Why is it so High ? Not so long ago everything was significantly cheaper. Then fuel prices went up by 50% from $1.00 to $1.50 per litre or more .Trucks use 30 to 40 litres of fuel per 100 km so that added $350 per round trip Sydney to Melbourne and back (or $700 Brisbane Melbourne Brisbane). That's maybe $10 to $20 extra for each typical small to medium job on the truck. However a far greater impact on costs has been that the the time to drive between jobs is now often over an hour or more in the main capitals when only 10 years ago it was just over half that. Speed limits have gone from 60 to 50 then 40 and now 25 km per hour. School zone times have extended from school times to nearly all day in some areas. Flagmen stand around all day watching their cranes and blocking the streets. 5 Kms of country road can be blocked and slowed to 40, so someone can prune a tree along there sometime during the day. And everytime there's a police car on the side of the road - everything has to come to a stop, nearly. This is an even bigger problem on the highways. There are more people, more cars. Roads are deliberately narrowed to make way for bikes, buses and trams. Adding another 30 minutes driving time to each job adds another $75 to the cost. Finally for jobs involving apartments the time taken to walk down two levels to the basement, wait for a lift, load a lift that's constantly beeping and closing its doors on the drivers, and probably a 100 meter walk inside the building itself to the door of the apartment can be horendous. All that explains why small jobs of $200 or less are no longer viable. If you are still wanting to save money, see what it will cost once goods are on the ground floor. Just change the specifications on for your quote and click 'save changes' to get another price. You may be able to bring your things to ground level beforehand. In some locations you can save a little more if you can bring goods to our depot on a trailer or in someone else's borrowed or hired van . We've received your price. Why is it so Cheap? If we're the cheapest there's no need to worry. Our prices are based on sharing the long distance part of the job with other users. We use very sophisticated algorithms to calculate our costs and your price. Our systems routinely require around 15 seconds of intensive processing time on high speed machines to assess and optimise all the routing and other variables that impact on your price. The work you would do going from website to website re-entering quote lists, comparing quotes and waiting patiently for someone to get back to you is all superfloused by our system. If someone else is cheaper - then maybe you should be worried. In all likelihood they've made a mistake. And as our old boss always said - “If you strike an unfair bargain – the other side will cheat”. What happens if I've got More to send? From a pricing point of view, just call or contact the office or change your list online and we will adjust the quote. Operationally, variations can nearly always be accommodated up to the day before pickup. Once the truck has been sent out there is always the risk of there not being enough room set aside for your extra items. If there is enough room, the price can continue to be varied pro-rata as before. If there is not enough room, the additional cost can be substantial. It then becomes a brand new 'small' job that will need to go on another truck (with a minimum charge of maybe $300 or more). Furthemore if the left behind goods need to be picked up on the same day with no flexibility we will need to arrange a special 'taxi truck service' to collect them and bring them back to the depot at even more cost. It is very important that we try to get the List correct in advance, not just from a pricing point of view but also to ensure that the job itself can be done properly the first time round. Btw: We aren't pedantic about a little bit of extra stuff. There can be a bit of give and take. Its only when people are deliberately overstepping the mark that is becomes an issue. What happens if I've got Less to send? Just call or contact the office or change your list online and we will adjust the quote. We can reduce the price up to the day before pickup. After that the space we need for your goods will have been set aside and it becomes part of the viability of the trip, so further price reductions on the day of pickup cannot usually be accommodated. Do we need Transit Protection? Transit Protection is an additional charge whereby we agree to accept liability for what can be broadly described as circumstances where damages and losses occur due to incidents beyond our control. Something has come up, Can I cancel without charge ? Cancelling a job with us has more serious consequences than cancelling a seat on an aeroplane or cancelling a hotel room or hire car. Aeroplanes fly anyway. Usually at least. If you cancel with an airline it just loses the seat price. When you cancel a hire car or hotel room or restaurant, the company only loses their profit on your booking. Maybe $20 to $60. Even cancelling a taxi is not as serious because the driver has probably just driven 10 km to 20 km, and will soon get another job. However if you cancel a removalist at short notice, it's not just a lost job. Work will already have been done, by numerous people especially for your job. Short notice cancelations impact on the utilisation of expensive equipment with high running costs that you have already agreed to use, and on drivers and offsiders that could be on standby and may already be on the way to do your job. Its a bit like arranging a painter and cancelling after the painter has already bought the paint. You are responsible for the consequences and the costs. If you cancel a removalist, then at best it may make a whole trip unviable. The profit margin on an entire Sydney to Melbourne trip may for example be only a few hundred dollars. At worst it is far more serious. Especially if the crew has already gone out to the pickup address only to discover that the job is not happening. In capital cities and in their metropolitan areas you can cancel up to 2 business days before pickup at no charge. In other (country) areas you can cancel up to 4 business days before pickup at no charge. After that there is a cancellation fee of 50% of the job charge plus any time spent at pickup charged at the time rate of (approximately ) $35* per 15 minutes, and with a minimum charge of 2 hours. Please note too, that if we cannot make contact with a person at the pickup address by phone or by confirmed text message on the day when pickup is planned, then we will not go to the pickup address and it will count as a cancellation. My stuff's been picked up. Where is it now? In most cases the same contractor that collected your items will also deliver. (Although as we've said elsewhere, we increasingly need to use little trucks to pickup or deliver into the inner areas of the major cities because they've been made somewhat impassable to large trucks). After your goods are loaded, and everything else is loaded, the truck goes to the other end and unloads in the reverse order. The last job on should be first job off. We can estimate when you will get your delivery - based on what should happen – and we can estimate quite accurately - but the reality is that no one in the world can know exactly, because the final outcome is a constantly changing thing. Unless you've been on a delivery run you might not understand, but every delivery address is a story in itself, in terms of finding the place, getting hold of someone to accept delivery, getting them to be there, finding somewhere to park and then dealing with building supervisors that want you to go down two ramps into the basement with 40 trolley loads, and then up a lift back to ground floor, rather than straight through the front door to get to the first apartment on the left 10 metres away in front of you. It can take 30 minutes just to eliminate the building supervisor*. *well - maybe not really. So a planned 20 minute drop off can easily and quite unexpectedly become 2 hours or more. Even when 2 minutes away from a delivery address, turning left into a narrow street might be impossible for a long vehicle because a light pole or traffic light on the footpath may be in the way. The truck will need to keep going, do a U turn somewhere and approach from the other direction so as to turn in from the right. That gives the truck more room. But finding somewhere to make the 'U' before that, can take 45 minutes in some places like Darlinghurst / Randwick / Richmond, inner Perth and inner QLD. And there's always a flipside! Delivery runs can equally as easily get done faster than expected. TIME WASTE WARNING: DON'T READ THIS UNLESS YOU'VE GOT NOTHING AT ALL TO DO. In this detailed email the client raises some matter of grave concern to her. We've added our comments where appropriate for illustrative purposes. Upon asking for a quote for the job, the people that we talked to on the telephone were quick and did an excellent and satisfactory job. They were also quite helpful, which I liked very much. When the quote and job was finalised, I asked for somebody to come and collect my 23 boxes of things on Friday the 18th November 2005. The person I was talking to said that if somebody did not give me a call on Thursday night, to call on Friday morning after 8.30am. Since on the Thursday, I had no phone call from Backloads.com, I called at 8.45am on the Friday to ask what time the truck would come. The lady who answered the phone at the time said that there was nothing in the system and that she would put in a time request and somebody would get back to me. 3 hours later, I still did not get a phone call - I called back to see what was going on, and the person who answered the telephone then said that the truck would come in between 1 - 6pm. Now I understand that you may not be able to give exact times for pickup. However, I think that 1 - 6pm is an extremely ridiculous time estimate. And for that matter, nobody had even called me to tell me that approximate time. Effectively, I had wasted three hours waiting - when I could have done something else. And furthermore, I specifically woke up at 8.45am just in case, when I could have had an extra 3 hours sleep! And I am sure that you are aware that moving house (and especially moving interstate) is a very stressful thing to do - and time wasters add a lot more to the stress than meets the eye. Our comment: For little jobs like this one its not really possible to call with an accurate pickup time till we have a time, and that's not really till the drivers have finished the previous pickup. Its different for big jobs that will take most of the day of course, but with the little jobs the drivers or the offsiders usually call ahead themselves as they get through the day. When I called at 11.45pm the lady on the telephone said that somebody will give me a call to give me a more accurate time. So I reluctantly waited from 11.45pm onwards until about 4pm. Because I had already wasted 3 hours - and by this time - much more than 6 hours altogether, I was very angry, and not very impressed at all. One would almost think that whoever answered the telephone (and I must admit, I regret not taking down any names in the whole process - I have clearly learned this lesson now), is an imbecile and can't think for herself. I asked for a more specific time and of course (surprise, surprise), she could not tell me - so she said, 'Well, it's between 4pm - 6pm, then' in a very unsympathetic manner (and quite frankly, in a manner that really gave me this message: 'Don't you get it! I already told you 1pm -6pm, so shut up!') Anyway, the driver finally called me at 4.45pm, and said that he would come in 15 minutes. It was just as well that I waited all day - and wasted 7 hours of my precious time waiting - when somebody could have told me that the truck could come between 4pm to 6pm. When the truck came, the two drivers informed me and my father (who was there at the time), that they actually told the main office that they would be there between 2pm - 5pm. Go figure: that is a whole 2 hours difference! Our comment: So the drivers arrived on time at the time we said they would all along. Maybe the father was there all day too, so she probably didn't need to be there herself, if she even was. If the drivers said between 2 and 5 then for us to add an hour is not such a bad move. In the end the drivers would have gotten there just after 5, so we were pretty accurate really. I apologize for the informality of this complaint, but do I sense a little communication breakdown here? The other thing I sensed, too, in this whole process, was a 'I don't care' attitude. And that is exactly the worst kind of trait that anybody working in this kind of business can have. Back to the beginning of this complaint, when I mentioned that I was waiting for my 23 items to be delivered to Willetton. When the two drivers came to pick up my things on that Friday (18th November 2005), they told me to ring Backloads.com on the following Monday to have a better idea of when I would receive my things. I arrived in Perth on the Sunday, and to be quite honest, I did not get the time to ring on that Monday since it was my very first day at work and that day and the following day was full of induction programs at my new workplace. So I finally got to ring on Wednesday (23rd November 2005), and the person who answered the telephone on that day said that nothing was on the system and that she would put in a time request. ('Oh no!' I thought. 'Do I sense a little 'déjà vu'' here?'). I requested that somebody sent an SMS to me about when I would receive my things, because at my workplace it is a policy to keep mobiles on silent modes. I accepted and understood that I may not get an answer straight away. So I waited and I waited. However, this time, I waited several days! (Only because normal busy people like me do not have the time to keep on chasing up things like this!) So finally on Sunday I called again to see what was going on (Why do I have to keep calling to see what is going on - if I ask for somebody to call me or SMS me back, why can't somebody just ***** call me back?). And, to my very own surprise (really? ), the person who answered the telephone said that there was nothing on the system! Our comment: As we say elsewhere, the rail service is notoriously unreliable. We can't notify people of an estimated delivery day until a container has actually been collected from the rail. Thats all information that we already send out with each booking. Questions were running through my head. Did the person I talked to on Wednesday REALLY put in a time-request? Or mayhaps, she was lying. Or mayhaps, there is something altogether wrong with the system. Or mayhaps, I am extremely unlucky. So, what happened on Sunday when I rang? Well, firstly, like I said before, the operator said that there was nothing on the system. Secondly, she said that she would put in ANOTHER time request, and that the things would definitely not arrive on the weekend (by this time, I am thinking: 'This is shocking!) and that somebody would get back to me. I told her that I did not want somebody ringing me 15 minutes before and telling me that my things would arrive in 15 minutes time, and that I needed at least a day's notice - when all the while I would be working in the city. Furthermore, I asked if I could get my things delivered after 6pm - because I obviously would not be able to get home from work until then, and there may not be anybody else around until then. Quite obviously, if nobody is around, where are the drivers going to put my things? Outside? If they do, this would be the epitome of my dissatisfaction! Did I get the answer that I wanted? Well, I guess I got a satisfactory answer at the time; the operator said that she would try, but she could not guarantee that it would happen. I guess that was fair enough. However, you cannot expect every client to wait all day for their things to come. People have to work, and sometimes workplaces are not as flexible as people would like it to be. And quite obviously, because of this, you cannot expect every client to come racing down from where they are from just to serve your own purposes. Our comment: If you are moving from interstate, then somehow you will have to arrange to receive those goods at some point. That point will be the time after the delivery before yours has been completed, and it will normally be during daylight hours, when its safest to deliver. That way the drivers can see where thay are going. It will normally be during weekdays. Even though many drivers would prefer to work on weekends as a lifestyle choice, its not always economically feasible. If you are starting a new job, don't stress. Your employer will normally know you have come from interstate and will be happy to let you go home when your goods are on the way. If they aren't, then maybe you shouldn't be working there. As a removalist of many clients who move interstate you should know this. You and every one of your employees should know and understand this. Like I said before, I understand that you cannot give an exact time. Quite obviously, due to traffic or other minor (or major) hold-ups, this is just not possible. However, as a removalist company operating for quite some time you are more than capable of giving at least a rough estimate (NOT '1pm - 6pm', and definitely NOT 'not this weekend... they will definitely give you one day's notice'). After giving the rough estimate, there should be more subsequent updates of when pick-up or drop-off would happen. Obviously it is too late now to undo the mistakes that your employees performed on my job (not on the pick-up and the delivery itself, but of the way they handled my calls and requests.) I have already undergone the stress - and actually, still undergo stress right now (because I STILL have not got a call yet to confirm a date my things are going to arrive. And it is now ALREADY 10 days (!!) since that Friday pick-up day. Did I not hear somebody tell me that it would take between 5 to 10 days for my things to arrive in Perth?). I think that your core system of how you operate needs improving. Your internal communications between the drivers and the telephone operators needs to improve majorly. If you think that giving peace of mind and satisfaction to your customers will cost more, then you need to increase your price then - and make sure that good changes are made. The main thing is, you need to keep your promises, and not just make empty ones just to brush people off. If you don't do anything after reading this letter, then, even though your sales may have increased because of your cheaper prices, you will lose more money than the increase in sales just because of dissatisfied customers. And as dissatisfied customers increase, you will lose business. It does not take a science or business genius to figure that out. And I think that since I have been kind enough to give you feedback, and not just complain to every family and friend that I have without telling you, I am also asking for my money back on the job, and/or a return ticket from Perth to Malaysia. I think that is adequate compensation for the stress that I have had to undergo because of my lack of peace of mind and trust of Backloads.com. I promise not to sue you, though, because I think it is a waste of money and effort for so little money. I will ASSURE you, however, that compensation or no compensation, I WILL complain to the company that recommended you to me in the first place, and ensure that they do not recommend you to anyone else (unless you can assure me that things will change in the near future), so that nobody else will have to go through the stress that I went through. I hope that unlike my recent telephone conversations with your operators, you will actually take action and actually show that you care, and not just brush-off this complaint with empty promises. I can assure you that I will be very disappointed if I get the same kind of response to this letter, that I have been getting to my recent telephone conversations with Backloads.com. Our comment: We thought that all in all this is quite a well thought out and well meaning complaint letter. The only issue is that the sort of service being requested here is kind of not the one that was booked. If time is really important we can provide a special taxi truck to pickup and or deliver, at a cost of maybe $200 more per end. For that reason we will notify you the day before that you should get your delivery the next day. But we can't be more specific. We tell clients in our letters and emails that we will call or text once we have completed the preceding delivery, or earlier if more notice is needed – but in that case be prepared for last minute delays. That is the best we can do. It is not helpful to then call our control center at 8.00 am on the day of delivery insisting on a time, and then continuing with a further barrage of calls at 30 minute intervals or less which invariable get to 'You've been lying to me all day, get me the manager and so on.' Our staff should not be subjected to this sort of needless harassment which totally wrecks a job that is otherwise picked up on time, delivered on time and undamaged, and done at probably half everyone else's price. It is far better to do what most of our clients can easily do, which is to leave their phone on and wait for a text to say the driver is on the way. Then call or text us back confirming someone will be there or that a key has been left out somewhere for example. Its a shame some people work themselves up into such a state that they feel the need to also send us further massive emails about this sort of thing. If time is of the essence, you can also think about booking a direct trip or exclusive use service. The head of AFRA (The Australian Furniture Removalists Associations ) has declared war on us by going into print with a warning – effectively saying 'You won't know where your stuff is if you use a backloading service. Actualy the opposite is true. If you use an AFRA company, your belongings will be somewhere in a container somewhere in some depot somewhere in Australia whilst they 'get a load together'. It might be there for weeks. Maybe even for months on end. During that period they may or may not know where your stuff is. 'Probably somewhere in Sydney depot. Mate'. etc etc. But they won't know when they are going to send it, because they won't know when the remaining jobs to fill the container will happen until they actually book in. If ever. But nevermind, at least you'll know it will be a quality service, because you'll be paying double our rate most probably. On the other hand with a backload service, its on a truck that's going in your direction and it should be on its way not long after its picked up. And then it gets delivered. Simple really. What if time is very important or I don't want my stuff loaded with other jobs ? When we send you a quote we will often also include Exclusive Use and Direct trip prices for the larger jobs. A Direct trip is exactly that, but there may already be other goods on the truck before yours are loaded. If there is no Exclusive Use or Direct trip price on your job it will most likely be because there are only a few items to send and the system thinks it will be too expensive to warrant consideration. However we can still do a direct trip. Please contact our office for a price or get yourself a quote for a 2 tonne vehicle load. What happens if I'm not available to accept delivery? We will text you the day before delivery and then call you again when the delivery before yours has been finished, (or earlier if you advised that you needed more notice). It is important that you answer our calls - including calls from private numbers -as we will not proceed to your address unless you confirm by voice or by text that someone is available to accept delivery. If you can't be there yourself please arrange for someone else to be there, hide a key, or leave a garage, shed or even the property itself open. We can lock it after us as long as you authorise it by text, email or chat. It is most likely that your load will be a shared load. It is vital that we unload the truck in the order that it needs to be unloaded. If we can't unload your load when we need to, it will block in the other jobs in front of yours as well. This can be chaotic for the drivers to deal with, for us to deal with in the office, for all the other customers already waiting for their deliveries and in the end for you. It means that your load- which may have taken an hour or two to load - will need to be shifted around on the truck - if there's room - or unloaded and reloaded again somewhere at the next delivery (or deliveries). Or it may need to taken to storage before the delivery run can continue. Organising storage and then unloading and getting back on track usually takes a good 3 to 4 hours out of the day. For that reason storage and redelivery charges are quoted, and will be applied if we cannot deliver as planned. All this may all sound harsh and severe and it can be, but we are only telling you what happens not just with us, but with anyone else you might choose to use for your transport. And of course there are exceptions. There may be times when it suits everyone to delay delivery. So - we need to TalK!! Don't be afraid to ask. Do you use containers and what's that like? In theory containers are great. They have strong sides that don't flex and they have tie rails – so everything can be tied back securely so it can't move. You would think that they travel nice and smoothly on the rail tracks and your stuff will arrive safely at the other end. Well don't bet on it. If you are moving to or from Perth/WA there's really no other choice. The cost of sending a container on that sector by rail is less than the fuel cost for a truck – without even counting driver costs and the costs of running the truck itself. The rail line between East and West is shocking, It buckles in the heat. The containers are stacked two high beyond Adelaide, making the wagons super heavy and on the hot tracks in the summer months the tracks buckle, and with a strong side wind buffeting the wagons the trains just constantly derail. Its a total national disgrace that no one ever talks about it and trains continue to travel double stacked, over heavy and then come to grief. 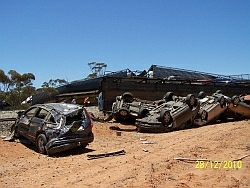 Other rail lines in Australia are not much safer. Trains are derailing all the time. With total loss of everything and no compensation paid to users like us. The tracks themselves are also quite bad in places. The wagons rattle and shake like they are going over cattle grids on country roads... and it goes on for hours on end in parts. If you've ever been on the Ghan you will know. We've heard stories of pallets of coke arriving in Darwin totally smashed from the vibration – and that was cans not bottles. At Pacific National and Aurizon's's rail terminals the fork lift drivers are known to pick the containers up and use them as battering rams to push other containers into place. So, knowing that, containers need to be loaded in a special way. For a start the containers themselves are not guaranteed to travel facing in the same direction they are loaded. Unlike a truck, there's a 50% chance they will travel with the doors facing the front. Then when the train wagons get shunted, they'll crash into the wagons in front of them and the whole load will fall forward like someone in a car when it crashes into a brick wall. So the load needs to “have seat belts on”. Everything except boxes needs to be wrapped in blankets, and most importantly, tied securely so that nothing can move. 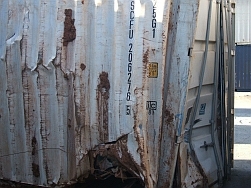 Ordinary removalists often have trouble loading a container. They all say they can do it, but most of them can't. When they load their trucks they don't have to worry about stuff falling backwards. They are not used to tieing things off properly. Loading properly takes a long time. If your removalist tells you they'll load a whole container in 3 or 4 hours you should be worried. It should take at least twice as long to load a 20 foot container properly. If you are planning to use someone that's going to use containers ask a lot of questions. Who's going to load it for you? Have they loaded containers before ? Have they ever been to the other end and unloaded stuff they loaded – to see how it travelled? We know it might be hard to actually ask those questions face to face, and for a removalist to know the answers in advance of the day. But they are the issues that come into play. So how do you solve the problem ? Book with us for all Perth transport. Try and use companies with road trucks for anywhere else. On other sectors the cost benefits of containers are debateable. The rail cost is still slightly cheaper than trucks on Melbourne-Brisbane-Melbourne but when one factors in delays at the rail terminals, that already adds 4 hours to the cost – at each end – and that 8 hours almost gets a load half way from Melbourne to Brisbane. And then there's all the costs like longer loading times to factor in. For journeys under 1000 Km. rail costs about the same as trucks - but the worst thing is it usually takes about 3 to 5 days to get there. Between Melbourne and Adelaide or Sydney to Melbourne or Brisbane will not normally be available at the other end for around 3 days. And thats if bookings are even available. Its always much better if the person who loaded something is also there to unload it. They will know where everything is - what items belong to what job - without having to consult load plans and lists. They would also have a better idea of what's in every bundle before they unwrap them. All those factors point to trucks being a better option than containers in general. And finally there can be huge delays on the rail system. During peak periods the rail can be almost permanently booked out by large retail clients, and no one seems to care about 1000's of ordinary citizens sitting in empty houses in Perth or Brisbane or elsewhere whilst less urgent commercial freight fills the wagons. Will the guys do a good job? If you go to any removalist's website, it will be just one massive flashy flashing sales pitch about how good they are, and only they are the best and beware the rest. Anyone can get a website like that for $800.00, even if they can't drive a truck, they've never moved a stick or they totally live overseas and have never been in this country. 'Look we are the most professional, we are australia wide, we are the cheapest, we can do no wrong - ever. 'Look at our reviews – 4.5 out of 5' and on and on it goes. Whatever the broad cross section of Australia's Removal industry says about itself is what you can expect, because those companies will be doing the work. On some sites there may even be serious warnings about the dire consequences of using a backload service. Yet even those totally professional 'we can do no wrong' people that make comments like that are nevertheless quite often well and truly involved in doing backload work themselves. We could write an essay about how silly it all is, but we are not sure how much time you have to read it, so we'll keep it relatively short! The average removalists use their $800 websites to say they are a family businesses, totally professional, with 30 years experience. Cynically you could ask '30 years experience' at what ? Who has the experience ? The person that will be moving you, or are they adding up their own lifespan, and the 12 months of a casual employee answering the phone. Or has the name been around for 30 years whilst the've had 15 owners. Even if they mean that there's actually a person there who has 30 years experience at moving people, they might also be 100% sick of it. The service you get all comes down to the men in your house on the day. The driver and his offsider. The driver will most likely be the owner of the truck, or an employee of the driver or the company that's drawn from a big floating pool of removalists that move around for place to place over the years. The offsider will more than likely be an extended family member, a neighbour or friend, or any other casual helping out on a fill in basis. If there's no-one 'good' around, you might get someone sent to you who's maybe not be so 'good'. And yet that person might do a much better job that the so called 30 year professional. Defining what's good in a person providing a service is a very personal thing! That's how it is for this service and for any other service for that matter. Will they want to do a good job ? Well most likely yes. Not necessarily just because they want to keep their job, or if the person doing the job is also the truck owner because they will want to get more business through us, and from you. They will want to do a good job because most people in the industry are good people and they want to do things to the best of their ability as a matter of pride. Which is also what human nature is like. Mostly. Will they be capable of doing a good job ? That's a different question entirely. There's quite a lot of things to learn and although it all seems easy on the outside, the little tricks you need to know about how to safely move different types of items without damage in and out of different buildings, around stairways, through tiny doorways, by using small cramped lifts and so on, without getting angry as well, can all take a few years. It all takes time to learn and depends on who has taught them and so much more. Honestly, in the end its like asking at the door of a restaurant whether the cook's going to be alright. Everyone has good days and bad days, and how you get on with the guys on the day is also a very important part of the process. People don't want to be treated like like dirt – and sometimes we will go into places where its immediately obvious that that's what they think you are. All in all, removalists actually do a magnificent job. Just think about it. When its raining, snowing or 44 degrees (and 55 or more in a container) nearly everyone else stops working outside. Removalists don't. They know you've got to move out. Or in. So they just get on with it. Up and down 3 floors of stairs with a whole houseload for 6 hours and then on to the next job. When its 5 pm and everyone else is off home after their 7.6 hours, removalists are often there with another 5 or so hours to go. They might complain but they'll finish the job. They'll keep going. And why do they do it - because mostly they really love it. Its the best job. The variety, the excitement of never knowing what will happen next, and then – if they are going interstate - its the life on the road, when you're not working just driving. And you get big muscles and stay fit. Its one of the few jobs left where you can travel, be your own boss and have adventures. (The only thing is that there's no money in it. Everyone is really just working for nothing and on top of that putting a little towards each move until they run out of funds for the next truck payment or repair). But back to the main question – in the end its like asking 'how do I know if my fush and chips will be nice'. Or my flight, Or my Doctor, Or my Spouse, or my kids or my plumber. Or my Prime minister. If you don't like the idea of it all being like that, its best to hire a truck and a trolley, buy 40 blankets for $600, a roll of ties for $150 and do it yourself with some friends if you are at all physically capable. Trucks will cost around $150 to $200 per day plus 50 cents per km including fuel. We'll even be publishing full self-load instructions in the near future. Because its easy to book, and we've got staff on hand that know whats going on. Because when you pay, your money stays in the country and not in some overseas tax haven. And, well, you just have to say to yourself that if we are dealing with the people who do the work all the time, we're not going to be consistently dealing with people that just cause problems. And hopefully we'll be cheaper. Apart from that its like choosing a doctor or hairdresser or mechanic or estate agent or bank. So good luck with your choice ! Hope its us. And of course our results speak for themselves. See next topic. *Like, because we google it. Can you prove you are any good? YES !! We can. 4.87 stars out of 5 . Here are some screenshots. These are from our contractor files. The 20 contractors below have done 22,019 jobs, resulting in 592 claims between them. That's a claim rate of 2.6 per hundred. On that basis over 97.4 jobs out of 100 have no claims. Actually however, its even less than that. Please Read on! When a claim is reported it is recorded immediately - even if its later found that nothing was wrong. That means if someone reports some missing bed screws and we tell them they are back in the old bed holes or in a chest of drawers, it will already have been reported as a claim for a missing item. Or if we've repacked a burst garbage bag into a box and the client doesn't notice that they have an extra box until after they call us, then it has already been recorded as a claim. Or if it is subsequently discovered that the person at the pickup end didn't send the item, it's still a claim on the list, as are cases where items go missing because they haven't been labeled with a name or address. Similarly items that are reported as damaged even though they were already damaged, or because they were inherently susceptible to damage because of the way they were packaged or constructed, are all recorded as claims. Big IKEA style wardrobes for example, where the staples may pop out of the back of them as soon as you pick them up or even try to move them. With at least 97.4 out of 100 jobs being completed without a phone call making a claim, we award ourselves the equivalent in stars. 4.87 out of 5 stars. These claim rates are for damages and misdelivered items combined. In reality its about 50/50 so its shows about 1.5% alleged damages and 1.5% alleged misdelivered items. When looking about these results you need to know a little bit more about how these figures were derived. 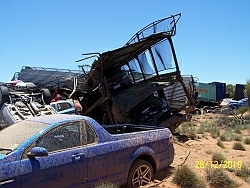 The claims listings include major disaster claims like when a truck is in an accident, which can result in multiple claims from the one incident. Furthermore overall in the long run claims are distance related. The further something is moved, the longer the journey and so the greater risk of an occurrence that could result in a claim. A contractor with a low claim rate is likely to just be doing Melbourne - Adelaide, and the highest claim rates will be connected with WA. Btw, in case anyone's wondering, blowouts and blowouts per job refer to when contractors report that clients have more than they say they'll have. And lastly – those claim rates are really really good overall. Some time ago, before we realised what was really achievable, we used a company on the Gold coast with 35 years experience for a lot of the work. Here are the figures they were getting with us. A claim rate for damages and missing items of over 6%. More than twice as many claims as for the average for jobs booked with us. That's how we know our service is so good.